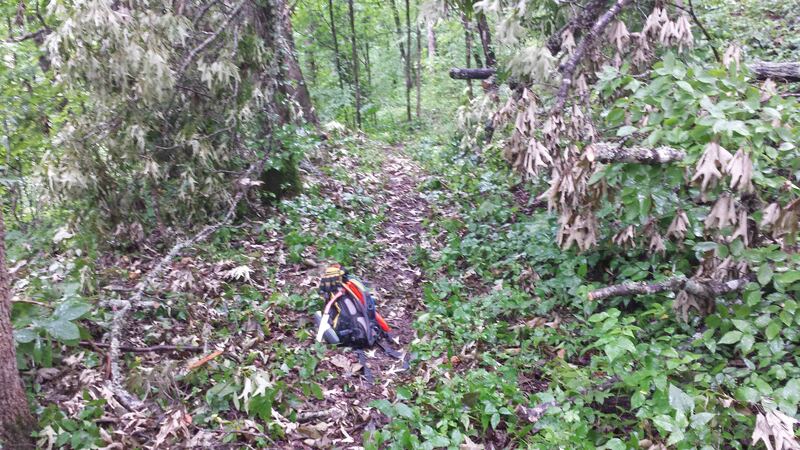 Recent heavy rains combined with some wind caused tree blowdowns on my adopted section of the Ozark Highlands Trail. I’d always bragged that my section was pretty easy to maintain because it’s down in the protective Jack Creek drainage, but my luck ran out this time. Mike, friend and expert sawyer, was planning to do some cutting, and I was going to “swamp” (clear out what he cut). 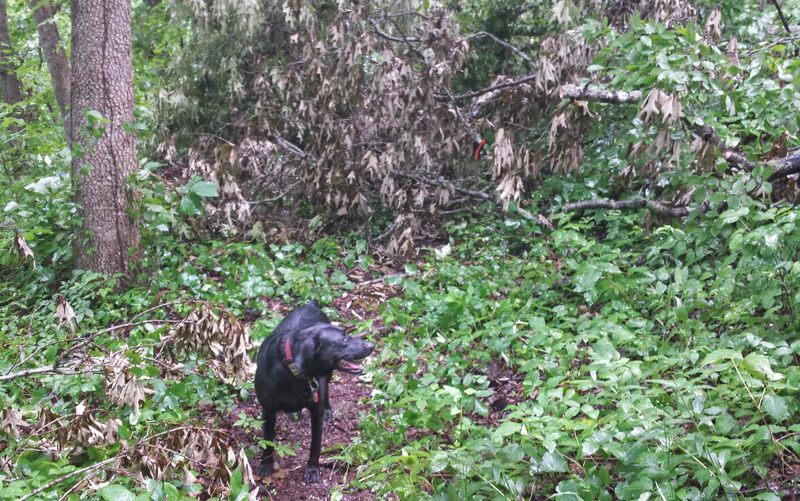 Rain meant chainsaw work wasn’t an option so I decided to take Hiker-dog and survey the damage, cutting what we could with my little handsaw. We found several trees across the trail, and I noted locations, but the real pleasure was in taking a few photos in between thunderstorms throughout the day. 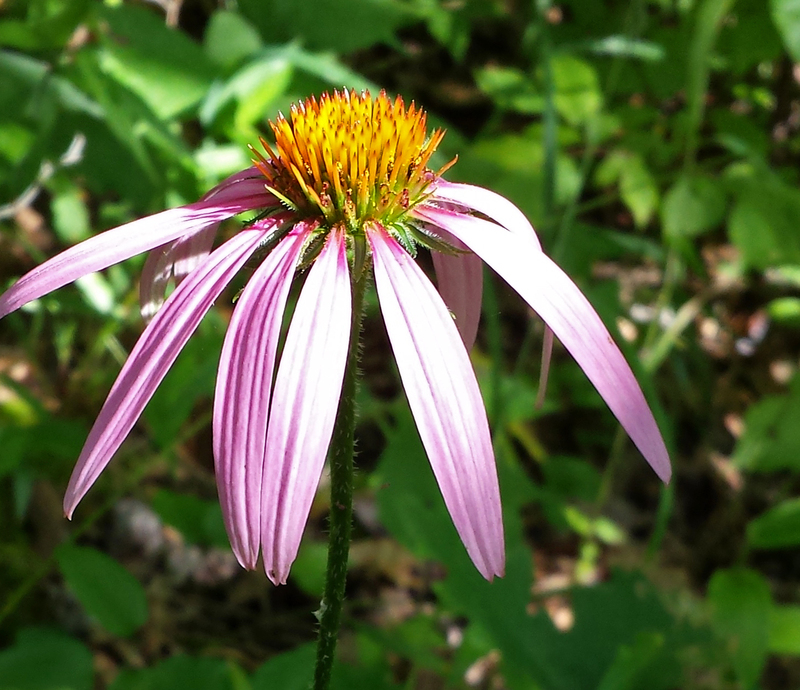 This cone flower next to the trail was drinking in the sunshine on a mostly cloudy day. 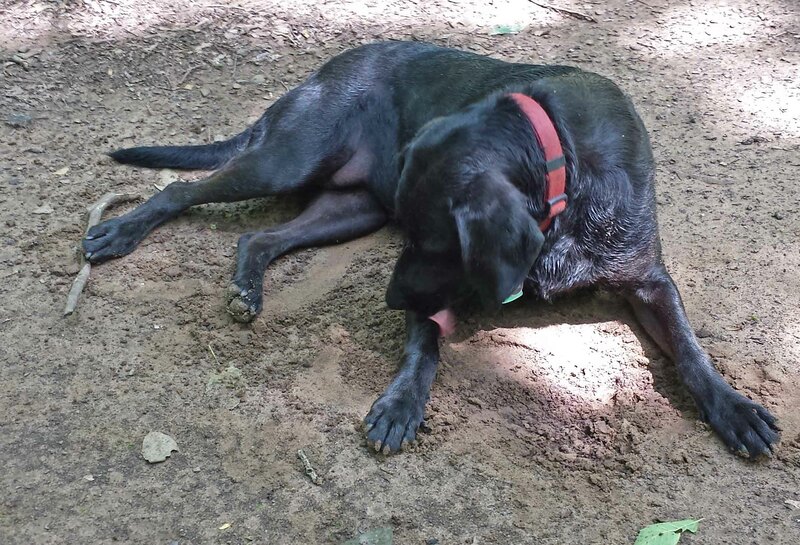 Hiker was excited about spending a whole day on the trail. She likes the water, so rain was no problem. She only jumped when a loud of clap of thunder surprised us while working. When we stopped at Jack Creek for a break, she did a little grooming. 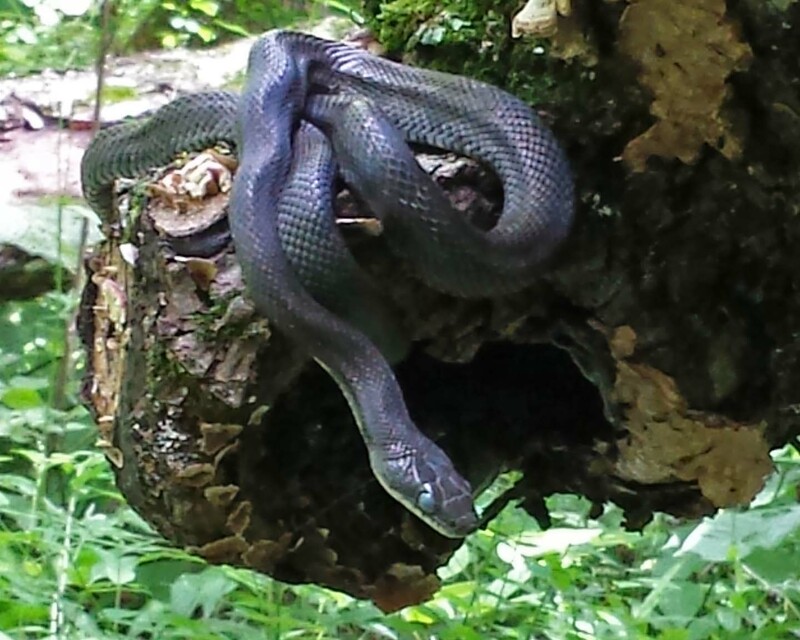 We came upon a little friend hanging out on a log across the trail. I paused for a photo. Hiker-dog was focused on squirrels and never noticed the snake up above. Because of the rain and plans to do maintenance, I left my good camera at home. 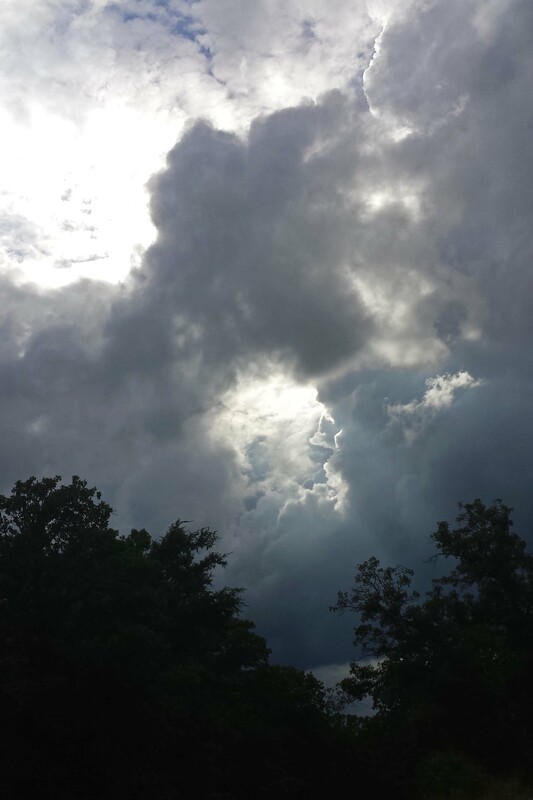 But, I ended up seeing a few things that needed to be captured so my cellphone filled in. Since there’s no reception down in the Jack Creek valley, I kept my phone turned off and stowed in a water-proof bag until needed as a camera. I enjoyed the challenge of taking photos using what I consider my least favorite camera, the cell phone. We were soaked through and through, but it was a beautiful day on the trail. Quick word about trail maintenance: Adopting a section of trail is a great way to help keep it open. Visit the Ozark Highlands Trail Association or other trail groups in your region to get involved. Below is a picture from before and after I did a little work with a handsaw. After some sawing and hauling. This entry was tagged cell phone photography, Ozark Highlands Trail, trail maintenance. Bookmark the permalink. Thank you for your work. My family and I enjoyed the OHT today and marveled at the thought of such kind people doing so much work to make so much amazing scenery possible for so many.